Since our last blog post, we’ve visited twenty more independent bookstores, one public library, and one museum dedicated to picture book illustrations in two Canadian provinces and three more U.S. states. That brings our total to twenty-eight stores in seven states and two provinces. We have approximately twenty stores, six states, and two weeks to go! In Montréal we stopped for poutine (French fries smothered in brown gravy and cheese curds) at a restaurant near McGill University. 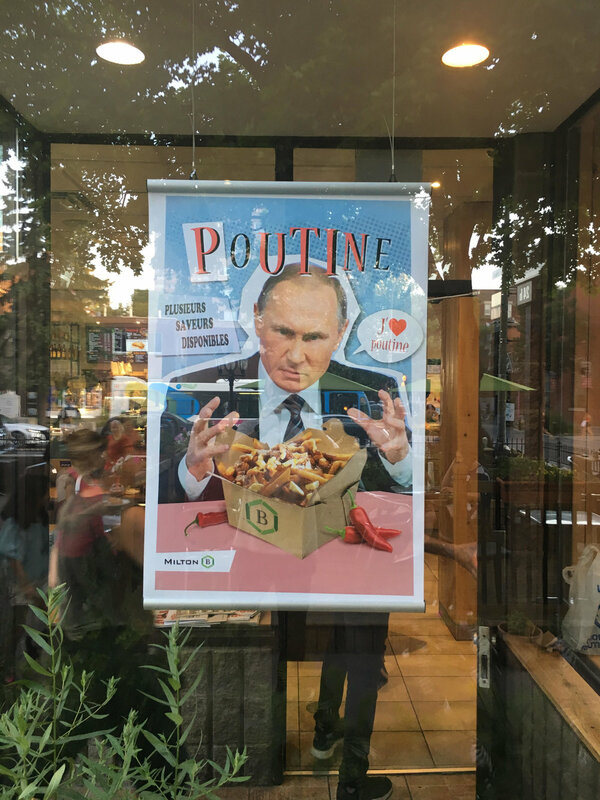 A poster in the window made a pun on Putin and poutine. The poutine was merely okay but the pun was delicious. At the restaurant I picked up a copy of the latest Montréal Review of Books and read a fascinating article by Elise Moser about the Quebecois kids’ book author Elise Gravel, whom you might recognize from the Disgusting Critters series (my boys love the one on slugs). I’m proud to say that this reminded me of Penny Candy Books. After all, it was a German book about an irate mole determined to learn which animal pooped on his head that partly inspired us to found our press. The first book contract we signed was for the North American rights to La chasse by Margaux Othats, which we published as The Hunt in Feb 2017. I’ve had a retail store in New Mexico tell me they wouldn’t stock the book for fear of angering the gun owners (which I took as a great sign). And when we acquired the world English rights to The Blue Pool of Questions by Palestinian poet Maya Abu Al-hayyat, we did so knowing that we might cause a stir in the U.S., merely because of who Maya was. We want to cause stirs. We like them. We’re okay with them. We think they can be necessary. These were my thoughts when we visited Brookline Booksmith in Brookline, MA, walking distance from President Kennedy’s childhood home. We’ve been presenting booksellers with a complimentary copy of The Blue Pool of Questions, and co-owner/manager Lisa Gozashti and I struck up a conversation over this title. Lisa told me about their new Transnational Literature Series curated by employee and writer (and fellow Emerson College grad!) Shuchi Saraswat. Shuchi was off for the day, but I subsequently struck up a dialogue with her via email and asked her if I could interview her about the Transnational Literature Series. We’ll likely publish the full interview at a later date but for now here’s some excerpts. “The Transnational Literature Series, which focuses on migration, exile, and displacement and works in translation is both an in-store section and events series. The two parts of the series came to be in different ways. "In early 2017, after Trump issued his travel ban, after the weekend of airport protests, one of my colleagues created a display in the bookstore window featuring books written by authors from the seven countries listed in the original executive order—Iran, Iraq, Libya, Somalia, Sudan, Syria, and Yemen. After a few weeks, we moved the display inside and expanded it and I took over stocking it. This became a politically motivated research project for me. Who were the writers from these countries? Whose work had been translated in English and who was writing in English? Who were the publishers publishing these books? Once I started asking these questions, the section grew quickly and organically. I started to pay more attention to translations, which languages were being translated, what kinds of experiences were being translated. The section combined a number of my personal interests—supporting small presses, focusing on international literature and immigration—and so I advocated for keeping it as a regular section which we titled Transnational Literature. Inside Brookline Booksmith. The Transnational Literature Series display is to the right of the person wearing the pink t-shirt. "Later that year, I hosted an event in the store for the anthology “This Is Not a Border: Reportage & Reflection from the Palestine Festival of Literature.” The anthology was a collection of witness writing, by primarily American and British based writers who traveled through the West Bank with the Palestine Festival of Literature. This was a book and an event that meant a lot to me. I had recently traveled to the West Bank with a peace delegation, and as a writer I had really struggled with writing about that experience in a way that didn’t center myself. Many of the essays in the anthology openly embraced the perils of witness writing while also keeping the focus on the Palestinians they met. Even uttering the word Palestine, as you know, can upset people. But I had figured that we were in one of the most progressive, intellectually curious pockets of the country. Boston, for all its shortcomings, is an extraordinarily literary city. And I wanted to challenge that by making us confront one of the more taboo and difficult subjects. "To promote the event, I did sort of a grassroots marketing effort, reaching out personally to friends and people who I thought might be interested. Because of that, and in large part thanks to extraordinary panelists who participated—Ru Freeman, Teju Cole, Khury Petersen-Smith, and Tom Hallock, who each brought their own audience—we had over 100 people come to the reading. To tell you the truth, I can’t remember how many books we sold, but I can remember the look and feel of the room that night. The audience was quiet and incredibly focused. Reverent. There were many activists in the audience, people of color, students, academics. But also a lot of people, regular customers, who were just curious. For the first time I really understood the privilege of having a community space, and how we could really use it. 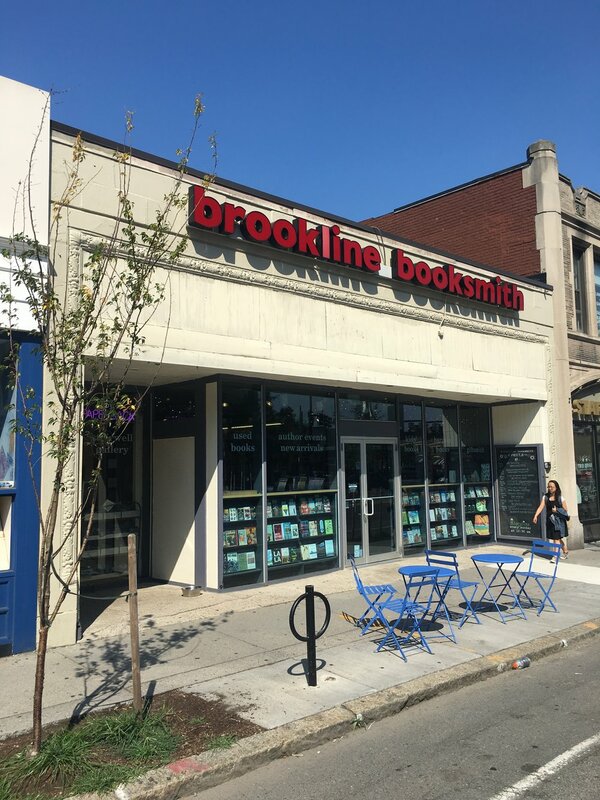 Kudos to Shuchi, Lisa, and the team at Brookline Booksmith for being a voice of conscience in a world gone mad. Yours is an example of the extraordinary work independent bookstores are doing all over North America to create the "physical and mental space" to get people thinking, and deeply.